thin the time of 4-6 hours per day and its classes are arranged due to the language level of learners. After the language course students are warmly invited to attend the lectures held either in Polish or English language. Every Friday there are workshops during which every person may check their cooking, choral and journalistic abilities. The didactic program is accompanied with the cultural one, which includes the sightseeing of Poznań and its monuments and excursions to the most interesting places of Great Poland and its surroundings. Moreover, all participants may attend various concerts, performances and exhibitions which are take place in Poznań at that time. Parties and integrative events held in Poznań clubs also arouse learners' interest. Completing the course, students are given the diploma confirming the completion of the Summer School of Polish Language and Culture School AMU as well as the document confirming the attendance in the language course. The document includes the information about the language level and the number of didactic hours of the entire course, which is crucial concerning the point system applied at the majority of universities. *) The fee covers costs of didactics, accommodation, meals, cultural programme, excursions, didactic materials. The fee does not cover costs of tickets and entrances to galleries, cinemas and clubs visited in free time. 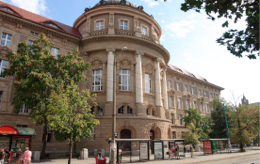 **) The fee covers costs of didactics, cultural programme in Poznań and all didactic materials. The fee does not cover costs of accommodation, meals, excursions.